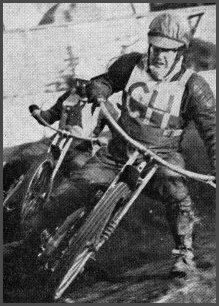 Derek started as a grasstrack rider before being spotted by speedway promoters and joined Wolverhampton in 1951 he also rode for Aldershot, New Cross, St Austell, Plymouth and Birmingham. Derek Timms joined Cradley at the beginning of the 1961 season, a little over a year after he was first asked to sign on the dotted line for the Heathens. He had attended the Dudley Wood winter training schools during 1959-60 but opted instead to join New Cross in the National League, while Cradley entered the lower level Provincial League. "I was too ambitious and missed a valuable season of Provincial League experience", he admitted in hindsight. Once in the Cradley team though, Timms stayed to provide four years solid and reliable service. Starting out as a grass track rider first and foremost, and expressing an extra interest in scrambling, his first taste of speedway was at Wolverhampton. After watching the track get tested out prior to the 1951 season, he cut his own teeth in practises with our Black Country rivals before making their Third Division team. He was then loaned to first St Austell, then Plymouth before retiring after mixed success. Following a further spell on the grass circuits in the late fifties, he returned to speedway and had a good season with Aldershot in 1959, topped by claiming second place in the Southern Area League Final, before the stint at New Cross. A mechanic by trade, Timms serviced his own machine, and was known for his determination on the track rather than any flamboyancy. After making his Heathens debut against Stoke on 1st April 1961, it took him just a little over a month before recording his first maximum with 12 points from four rides against Middlesborough. Derek finished that season with a Provincial League average of just over 6.00, which suffered only through a slight dip in form during a bonanza of away trips during August. Only the top two, Ivor Brown and Harry Bastable, made more league appearances for the Heathens in 1961. Recalling some of his experiences riding for Cradley, Derek mentions an occasion at Exeter when he incurred the wrath of the legendary Howdy Byford. After unintentionally knocking Byford off his machine as the pair went into the corner, Derek got up and went to see if his opponent was all right. "He didn't wait for an apology, he just clouted me on the neck", says the former Heathen, "There was a bit of a scuffle and we had to be parted but when we went into the pits Howdy just laughed, put his arm round my shoulder, and said 'That was a bit of fun wasn't it?'" The other infamous incident in Derek's catalogue, which has received a mention in more than one previous profile of the rider, occurred one day at Rayleigh. "The zip on my leathers burst open at the starting gate", he explains, "and at the same time my fuel cap flew off. Dope spurted out everywhere, and I mean everywhere. I was in agony!" Timms scored better than his debut year when returning to Cradley the following season, 1962, before slipping in and out of the team and retiring again in '64. Just like the spell in the fifties, he couldn't really keep away. 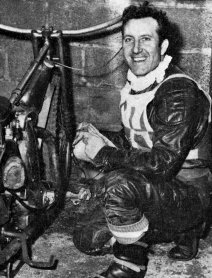 Although his stint with Cradley had finished, he made another comeback in 1969, sharing his time for two seasons between Crayford, Doncaster and Wolves before making the final break. Derek re3tired for a few years before joining Crayford in 1968 then Doncaster in 1969. Until the mid-nineties, Derek still worked at a motorcycle spare parts warehouse near Villa Park, where his wife Margaret was also in charge of the office. Sadly Derek passed away on December 12th 2015. He left Margaret, four sons seven grandchildren and six great granchildren.